The following list includes some basic facts about cold sores. 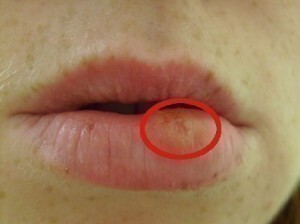 Cold sores are also referred to as fever blisters. They are red, painful blisters that are filled with fluid and usually appear around the lips, chin or cheeks and in the mouth. They could also appear in the genital area. They are caused by the Herpes Simplex Virus (HSV) which invades the cells of the outer skin layer. Cold sores are contagious (passed through close personal contact) and will cause the affected area to become swollen from the inflammation. Cold sores that affect the mouth and lips are symptoms of oral Herpes and are caused by Herpes Simplex Virus type I (HSV-I). The cold sore that occurs in the genital area is typically caused by Herpes Simplex Virus type II (HSV-II). The first sign of an outbreak is a tingling sensation, soreness, swelling or tautness in the area. Within three days, the red painful blisters are formed and due to rupture, the sores appear to develop a yellow colored crust. Once the sores begin to dry out, they will become covered by scabs and begin the healing process. Cold sores usually go away within fourteen days of an outbreak. Cold sores can affect both adults and children and may reoccur in some cases where the outbreaks are triggered by factors such as illness, menstruation or emotional stress. When there is no outbreak the virus remains inactive in the nerve cells. The following list includes some home remedies that can be used to alleviate pain caused by cold sores. Lysine: Lysine is an essential amino acid that cannot be synthesized by the body, but it can be derived from dietary sources or supplements. Lysine produces a protein which is essential for fighting infections. Lysine has been found to inhibit the spread of the Herpes Simplex Virus by preventing an amino acid in Herpes Simplex Virus that facilitates its replication. As a natural remedy for cold sores, a person can eat foods rich in lysine. Some of these dietary sources include dairy products like milk and cheese, eggs, lentils and sprouts, beef, protein foods like red meat and fish. For more effectiveness in fighting cold sores limit your intake of chocolate, peanuts, almonds and other food sources that contain the amino acid Arginine that aids in the process of replication Herpes Simplex Virus. Lysine can also be applied to cold sores when used as an ointment. A person suffering from cold sores can also take Lysine supplements. It is best to consult a trained medical practitioner before doing this as they can advice regarding dosage and duration for taking the supplement. Lemon balm: Lemon balm is used as a topical herbal treatment for cold sores. It is a member of the mint family and is a soothing herb that aids in stress reduction, easing anxiety, promoting sleep, improving appetite and reducing pain and discomfort associated with digestion. Studies show that when applied topically, lemon balm may help heal lip sores associated with Herpes Simplex Virus and reduce the associated swelling and redness. Resveratrol: Resveratrol is a chemical compound found in grapes, red wine, purple grape juice, peanuts and some berries. Resveratrol has been found to inhibit the activity of several inflammatory enzymes. It is suggested that as a natural remedy for cold sores, Resveratrol cream can be applied topically a few times daily to effectively suppress cold sore development, once applied within 6 hours after infection with the Herpes Virus. Peppermint oil: Research reveals that peppermint oil may inhibit the reproduction of Herpes. Peppermint oil is a herbal remedy that should only be applied topically to the affected areas. Zinc: Apply zinc as a home remedy for treating cold sores. 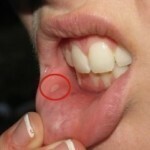 Zinc can be applied directly to cold sores to accelerate the healing process. Use the zinc oxide cream as a topical treatment or take it as supplements after consulting a trained medical practitioner.